Priyanka Chopra will make an appearance in the Jonas’ brother’s comeback music video Sucker. The Jonas Brothers are back! Priyanka Chopra and Nick Jonas surprised their fans with the announcement of the comeback of the popular boy band. 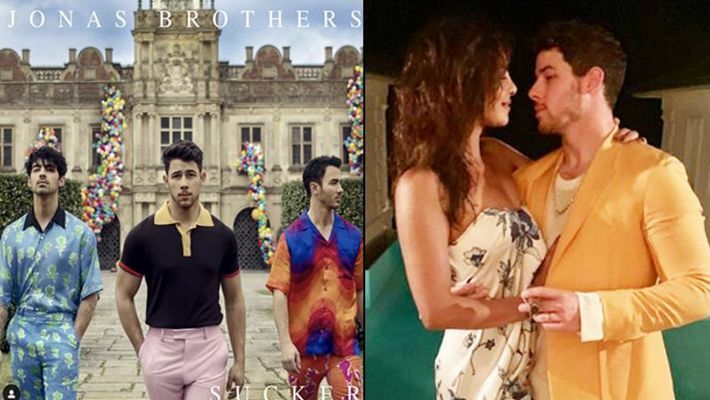 Welcoming the boy band back to the music scene, Priyanka took to her Instagram account to share the news along with a picture of the three brothers--Nick, Kevin Jonas and Joe Jonas. She wrote, "And yes they're back…and may I say… hotter than ever. So proud of the family #Sucker #JonasBrothers #MidnightET." The trio can be seen posing together in colourful and casual outfits. Nick too shared the same picture as well as a video on his Instagram account which consisted of the message of their comeback. The video shared by Nick is from their appearance on 'The Late Late Show'. The promo video shows host James Corden driving his car through Los Angeles and picking up Joe on the way. The two are later joined by Nick and then Kevin and that's when Corden asks if this means something. The Jonas Brothers finally announce the happy news of their reunion. They also revealed the cover of the band's new single 'Sucker', which marks the reunion of the popular brothers. Cheers to you and cheers to new music 🎉 #Sucker is out now!! The Jonas Brothers are considered to be one of the best teenager bands of all time. However, the trio split up in the year 2013 and started concentrating on their solo musical careers. The Jonas Brothers are reuniting after a hiatus of six years, reported Entertainment Weekly. The 'Late Late Show' will mark the return of the brothers in a series of episodes from Monday (March 4) to Thursday (March 7). They will kick-start the week by discussing and sharing their reasons for getting the band back together now. Then, throughout the week, the band will take part in sketches, songs and various other show segments. There will also be the world premiere musical performance of their new single, 'Sucker'. The Jonas Brothers first entered the musical scene, capturing a million hearts with their songs back in 2005. After the split, Joe and Nick both went onto have successful music careers and high-profile romantic relationships. Meanwhile, Priyanka will be next seen in 'The Sky Is Pink'. The film marks her return to Bollywood after a hiatus of almost four years. Her Hollywood film 'Isn't It Romantic' will release on Netfflix on February 28.